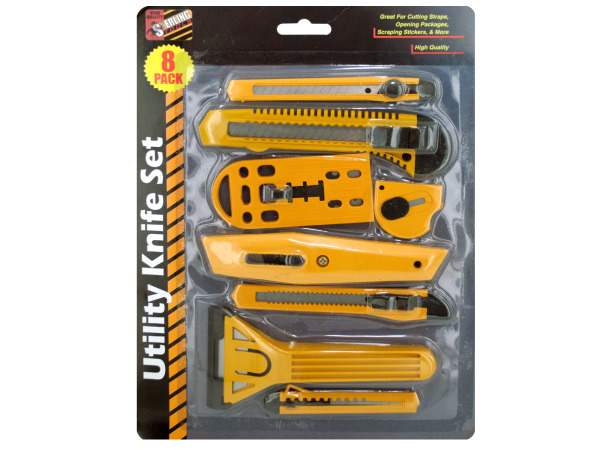 Great for cutting straps, opening packages, scraping stickers and more, this 8-piece Multi-Purpose Utility Knife Set comes with every utility knife your toolbox will ever need! Includes: 1 window scraper, 1 large snap-off knife, 1 mini snap-off knife, 1 pocket key chain knife, 1 safety scraper, 1 utility knife and 2 middle snap-off knives. Comes packaged in a blister pack.